On the edge of the Mara Triangle, beneath the Olooloolo Escarpment, Swahili for “zigzag” lies a lush, magical oasis of giant fig and wild ebony trees that is home to an intimate, colonial, Kenyan escape. The sanctuary of comfort, shade, coolness and luxury is a welcome retreat from the heat and wide open spaces of the surrounding savannah. Enquire now and let us plan the ultimate East African Safari for you. Immerse yourself in traditional Maasai culture and learn about it through the staff, the camp naturalist, the interactive Maasai dancing or a visit to the neighbouring Maasai village. Learn about the extraordinary Maasai culture, made up of so many interesting cultural anomalys and unique beliefs. You will be amazed at the stories you will hear. Such an interesting tribe with so much to teach the average Westerner! A stark contrast between gentle kindness and fierce courage, they live happily in their own world, wholly at peace with nature. Each suite sits with its back to the comforting canopy of tress and opens out onto the golden grasses of the endless Mara plains. The contradiction of the dense wooded area to the wide-open plains is spectacular. A birder’s paradise, the birdsong is endless and fills the air with only the happiest and musical sounds. From lilac breasted rollers, to African emerald cuckoos, to Sambiri barbets, many colourful butterflies and the striking blue Monkeys this tropical paradise is enough entertainment in itself. Go beyond the canopy of trees on an expertly guided game drive or walk and learn more about the intriguing habits of not only the plains game and the big five but also of the birds, insects and other smaller beings they share this beautiful land with. Recently refurbished with all the latest deluxe comforts Bateleur Camp is even more inviting than it’s ever been before. The two camps of nine suites each, boast polished wooden floors, vintage carpets and exquisite furniture ensuring a stately yet welcoming feel. A cosy central fireplace sits at the heart of the twenties style sitting room, scattered with delicate ivory lamps, substantial tree trunk stools, lanterns, old English portraits, classic suitcases, tartan throw pillows and soft delicate mohair blankets it takes you back to a time of intrepid explorers. Dine outside under the trees as the wind whistles through the leaves, the lions call in the distance and the cicadas and the tree frogs join in to complete the evening symphony. 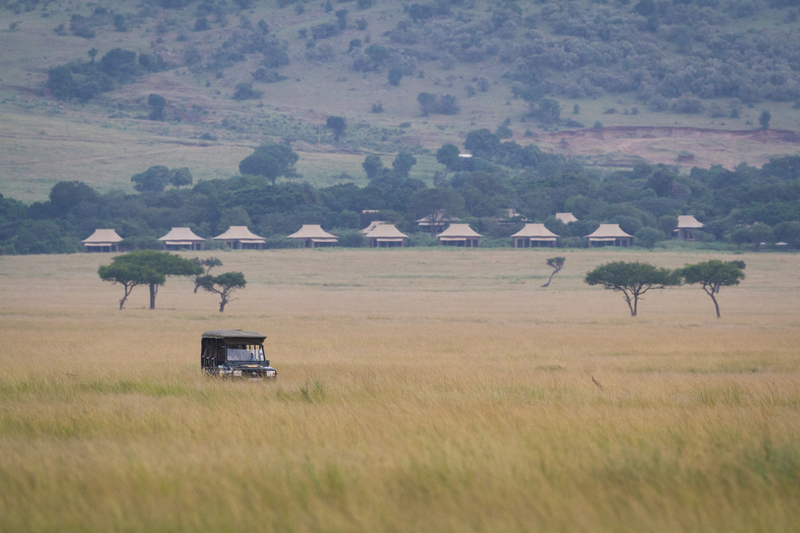 Each tented suite opens directly onto the plains, completely secluded from the next and at one with the bush around it. A large four-poster bed forms the centre of the luxuriously furnished suites, complete with exquisite wooden finishes, rock walls and warm Maasai colours. It all combines to make sure that you “lala salama” Swahili for sleep well, at one with the abundance of nature that surrounds you! Arise to the sound of your private butler waking you with cups of steaming hot coffee and delicious nibbles to get you ready for yet another day exploring the magical Mara triangle. In true andBeyond style the staff are attentive, welcoming, polite and willing to go to the ends of the earth to make your stay as memorable as possible. Both Air Kenya and Safari Link operate two scheduled flights per day from Nairobi’s Wilson Airport. The flights take approximately one hour followed by a 30-minute game drive to Bateleur Camp. The ultimate authentic Kenyan experience. Bateleur will transport you to a bygone era with its classical colonial hospitality. Relax in the coolness of the lush forests while the vast expanse of the Masai Mara stretches out before you. Kenya is one of the world’s ultimate safari destinations. It’s one of those places that has so much to offer and everything in absolute abundance. There is no best time to go but here are a few pointers just in case there is something specific you are looking for. June to October is the winter/dry season. This is when the bush is less dense and animals are much easier to spot as they generally congregate near waterholes. There isn’t much rain at this time of year, the skies are blue and there are a lot less mosquitoes than in the summer months. It is also the best time to see the incredible wonder that is the great wildebeest migration, although parks are generally busier at this time, as a result. Iconic Africa have an exclusive range of only the best, hand-picked lodges and hotels which we know, regardless of your travel wishes are sure to surpass your wildest expectations. Simply contact one of our African travel experts and begin your journey to Africa with us now! Perched on the edge of Africa’s Great Rift Valley is a lodge that comes as close to heaven on earth, as possible. 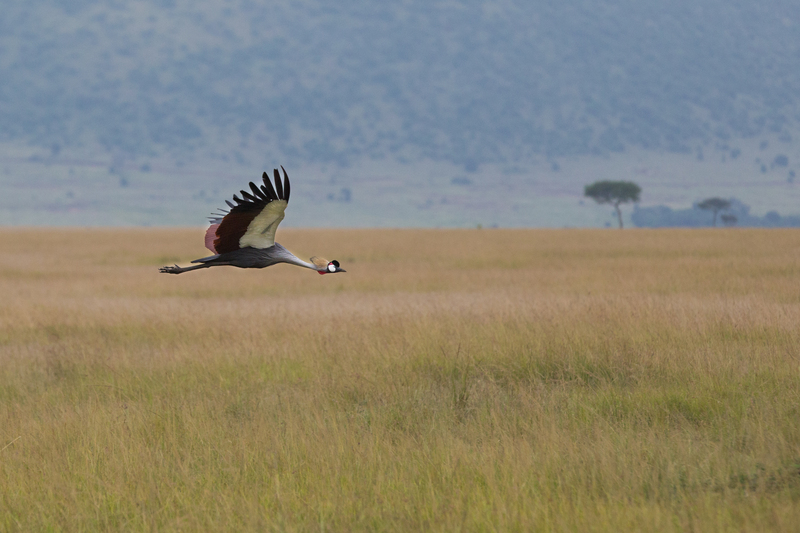 Angama Mara, Swahili for “suspended in mid air” boasts the best views in the Masai Mara. A place that constantly takes your breath away, where happiness reigns and peace is all encompassing, where you literally stand on the edge of the world. Owner managed and run by the reputable Fitzgerald family, Angama Mara is the ultimate African safari destination. Situated in the luscious river woodland of the Ntiakitiak River, within the Olare Motorogi Conservancy on the Northern border of the Masai Mara, is the definition of grandeur and colonial opulence. Mara Plains is a lavish and magical wonderland. From the minute you step onto the rope bridge, you are immediately transported into your very own, African, home away from home. “A camp’s success is in the details,” says Dereck Joubert, CEO of Great Plains and Mara Plains is testament to this. There is not a single item within the entire lodge that has not been put there for any other reason than to ensure that you have the most decadent and enjoyable stay possible. Perched on the lofty rim of the Ngorongoro Crater, in amongst giant fig trees, this award-winning lodge is like something out of a fairy-tale. Boasting breathtaking 360-degree views of one world’s most celebrated wildlife havens, it will leave you breathless for days. Fit for royalty, the ornate architecture, dramatic interiors and the most opulent finishes, transport you into a world like none you’ve ever been to or even dreamt of before.